Edraw offers you a number of ready-made circle spoke diagram templates which you can use in your drawing and free. Edraw is used as a circle spoke diagram software coming with ready-made circle spoke diagram templates that make it easy for anyone to create beautiful circle spoke diagram. 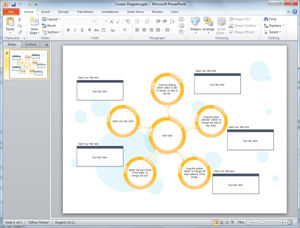 The circle spoke diagram templates are easy to use and free. 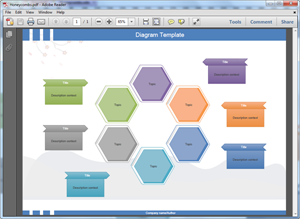 Edraw can also convert all these templates into PowerPoint, PDF or Word templates. Creating a circle spoke diagram in Edraw is easy. It only takes a few seconds to choose a basic template, insert text and images, and add the finishing touches. If you want to use a ready made template, go to circle spoke diagram templates page and choose the Circle Spoke Diagram that best suits you. When you finish creating your circle spoke diagram in Edraw, one click on the Export button will transfer your drawing into MS PowerPoint presentation. 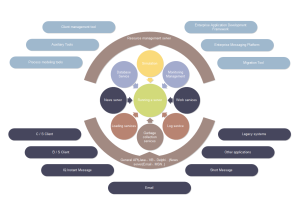 You need to consider few things when creating a circle spoke diagram to present your business report. Edraw is completely integrated with MS Office, so a single click on the Export PDF button will convert your circle spoke diagram template into PDF. 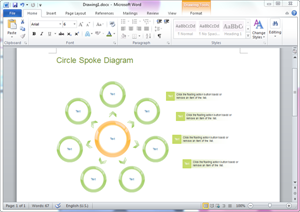 You can click the PDF Circle Spoke Diagram Template to view the quality. Edraw Circle Spoke Diagram maker is elaborately designed to produce creative, great-looking and professional circle spoke diagram from templates. All templates have been carefully created by Edraw to help you make outstanding circle spoke diagrams to impress your audience. Our stunning collection of editable templates can easily fit in any word, pdf or PowerPoint presentations. Discover why Edraw is an excellent program to create circle spoke diagram. Try Edraw FREE.